I’m pretty much noodles obsessed and though I had some misgivings about the first ever Ramen Yokocho Fest aka “Ramen Alley” organized by a local paper, Weekly LALALA, I still went to the South Bay to try my luck at this festival in Torrance. They had advertised 12 vendors of which 5 were from Japan, Hawaii, San Jose and Las Vegas. Perfect, I thought, I’m going to try the Japanese vendor and I also wanted to try these other out-of-towner ramen bowls. Eh, everyone and their mama also had the same idea! We got there on Saturday just before 2 p.m. My friends dropped me off to wait while they searched for parking. Parking was free but the lots were overflowing. This should have been our first tip-off all was not well at the Torrance Cultural Arts Center. By the time they parked, I moved several feet but then we discovered the line actually wrapped around the building. I sent off my friends to ask the folks at the front of the line how long they waited. Two hours. TWO!! Later, I heard the line had varied. If you got there right at 10 a.m., perhaps you waited about an hour. But if you got there later, I heard some waited as long as three hours and the horrific part was some vendors had run out of food by 4 p.m. The event was to go to 8 p.m.
Did I wait for 2 hours then to wait another hour or two to buy tickets and then possibly 3 hours for the Japanese vendor? Hell no. I’m not waiting 7 hours for a bowl of ramen. I could have flown to Vegas or San Jose, ate my bowl of ramen and flown home. It would have been more of an adventure. No, we opted to go to Ramen Hayatemaru which was on the list as vendors from the local area. Sadly, they had run out of broth by the time we got there just before 2:30 p.m. Quite a few ramen shops in the area had just closed and wouldn’t reopen until later for dinner. The few that stayed open between lunch and dinner were invaded by other unhappy ramen fest goers. We eventually made it to Umenoya which claimed their kitchen would be open until 2:20 a.m. (they close at 3 a.m.) when we called. Fine, fine, away we went. 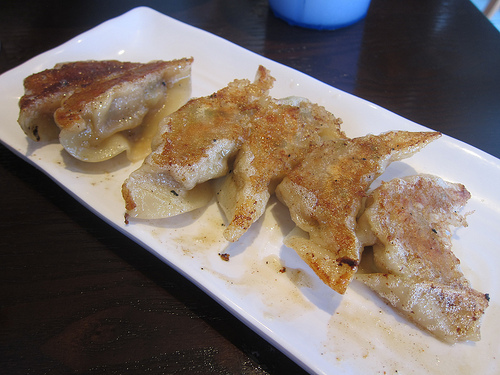 We got the gyoza to start. We opted for the Russian roulette style in which one piece was super spicy. Guess who got that one? Yep, me. As my face turned as red as the guy in the poster advertising such splendid gyoza, I thought about the day. I have been to plenty of first time events and it always seem to end in disappointment. This deters me from going back to what would hopefully be a better organized event the next year. I think these festivals should sell tickets for set times. That way you know exactly how many people are coming between 2-4 p.m. Or noon to 2 or 4 to 6. You get the idea. I had heard the vendors had about 5000 portions. To be sold out hours before they closed meant it was a success but they also had to face the wrath of hot and hungry people still waiting in line. Luckily my bowl at Umenoya was fine. 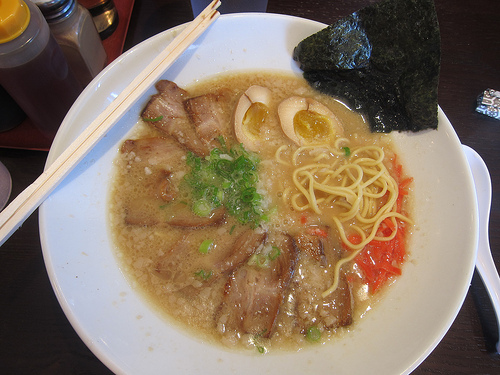 I think Daikokuya still makes the best tonkotsu. This broth was pretty fatty but I like melted fat and having blobs float around was kind of gross. But did I care? Did I wait 30 minutes for this bowl? Yes, better than 7 hours. The noodles were on the firmer side. The egg was great and because we got the extra chasu bowl, there was plenty of meat. I did wish for bamboo shoots which you had to pay extra for. 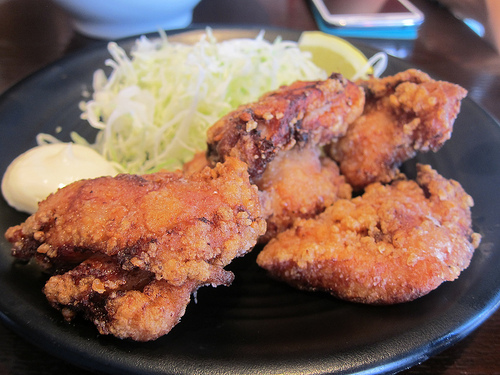 Also, the karaage (fried chicken) was fantastic. It was my favorite thing we ate at Umenoya. I’m not going to attempt next year’s ramen fest if they decide to do it again unless they make some changes. Free food fests seem to turn up the craziest lines. Maybe I’ll save up some pennies and go to Japan and seek out a real ramen alley.